We’ve all seen the pictures of that simple, flat black band alternative listed in the original catalog and magazine ads for vintage Heuer chronographs. 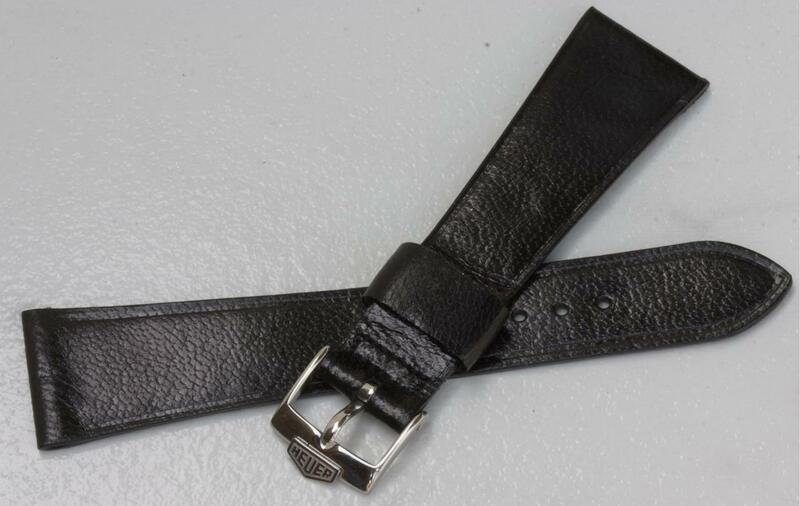 Here’s a 22mm black vintage band in high-quality goatskin, tapered just right so it takes a 16mm Heuer buckle. 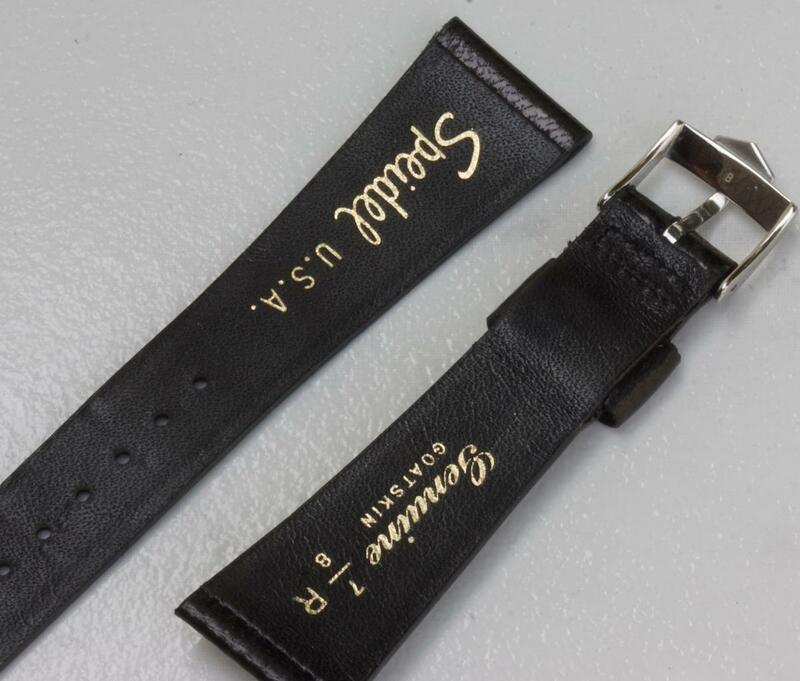 Has the single thick vintage strap hold-down keeper. Band is New Old Stock 1960s/70s. Flat, unpadded type. Thickness is 2.7mm where the band meets the watch and 1.6mm at the tail end. Made by Speidel USA. Has a very light goatskin pattern to it. 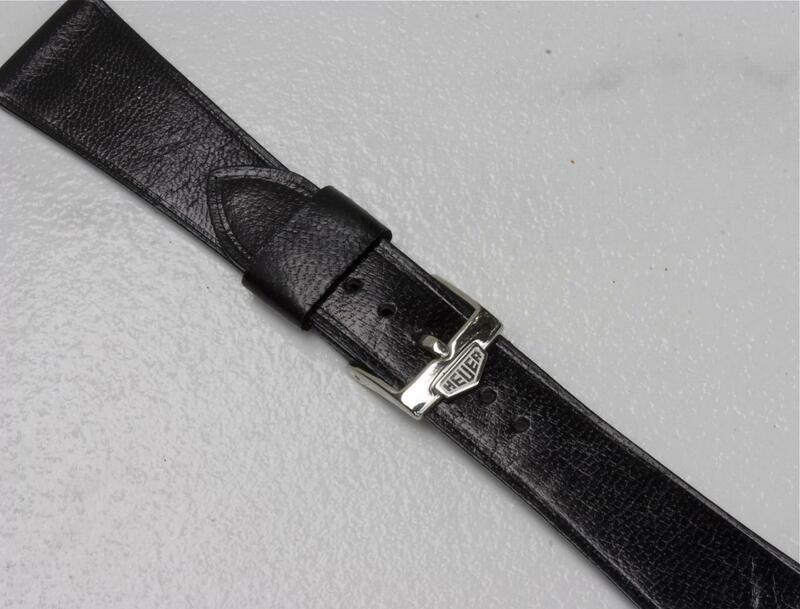 Pick the version that best fits your wrist: Regular Length band measures 7 3/8 inches (18.8cm) placed end to end without the buckle counted in or 113/75. 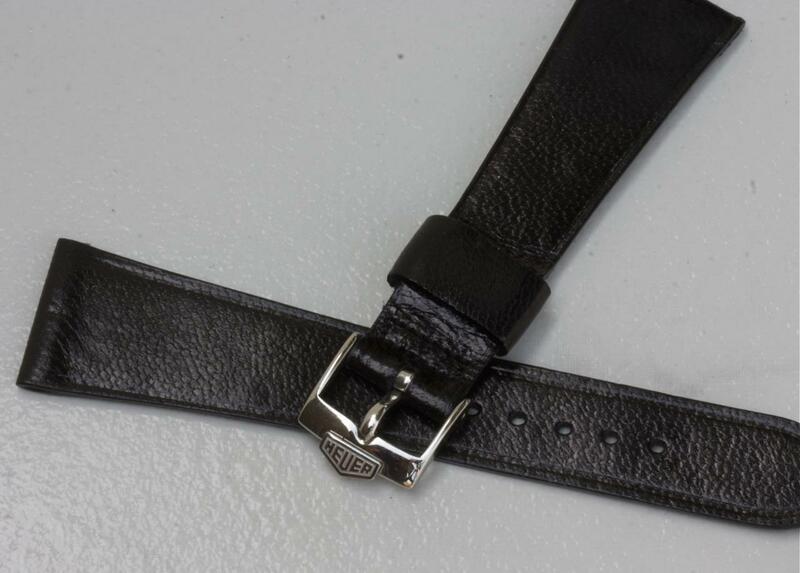 Long Length band measures 8 1/2 inches (21.5cm) placed end to end without the buckle counted in or 127/88. Good vintage exotic skin bands in 22mm are really difficult to find, especially ones with the right tapered 22/16 shape for Heuers, Breitlings and Omegas tapering to 16mm buckle ends. This band would be a nice change of pace for your Heuer Monaco, Heuer Silverstone or Heuer Calculator to accentuate the large watch head with a simple, flat band. Or pick one up without a Heuer buckle for one of your other large chronos. 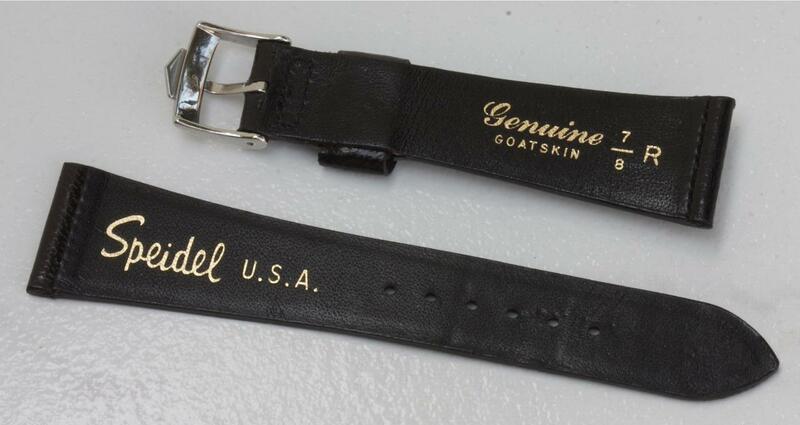 BAND ALONE: If you want the band without a buckle, the price is $59.99 including U.S. shipping & tracking, or $75 shipped internationally via First Class. BAND & HEUER REISSUE BUCKLE: $185 including U.S. shipping with tracking or $220 for international shipment with tracking via Registered. This 22mm band is also available in a more highly textured version. Same band is available in 18mm in Short, Standard or Long versions to your early Heuer Carrera watch. Email for photos and more info. PAYMENT: Paypal payment to billmahoney@aol.com or money order/check by mail.